(CBS/AP) Actress Elizabeth Taylor, who died on March 23, 2011, less than a month after her 79th birthday, was as famous for her marriages as her movies. "I think I ended up being the scarlet woman partly because of my rather puritanical upbringing and beliefs," the British-born actress once said. "I couldn't just have a romance; it had to be marriage." Her husbands were a hotel chain heir, an English actor, a flamboyant producer, a pop crooner, a Welsh actor (twice), a U.S. senator and a construction worker. Taylor's love life probably received more public notice than any figure in history, including Cleopatra, whom she portrayed in a famous 1963 film. She encountered a portent of things to come during her first romance, with Glenn Davis, the famed "Mr. Inside" of the Army football champions. When her dates with Davis attracted huge press attention, Taylor commented, "Maybe I should have fallen for a busboy, then the whole thing wouldn't cause so much attention." A year later, her mother announced Taylor's engagement to William D. Pawley, 22-year-old son of a former ambassador to Brazil. The engagement was canceled three months later, and Taylor was rumored to be dating Howard Hughes. Mrs. Taylor angrily denied her daughter had ever seen the bashful billionaire without her parents' being present. 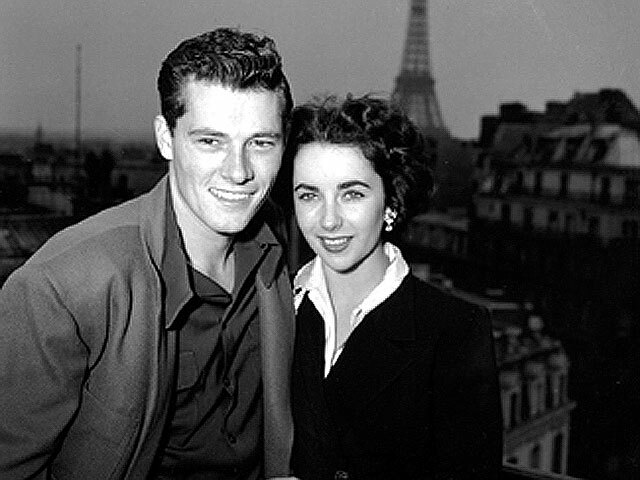 The wedding of Elizabeth Taylor, 18, to Conrad Nicholson "Nicky" Hilton, 23, on May 6, 1950, was hailed as the Hollywood social event of the year. They were married by a priest (Hilton was Roman Catholic; his bride was not) with a lavish reception at the Bel-Air Country Club. "The honeymoon in Europe lasted two weeks," Taylor wrote in a 1965 memoir. "I should say the marriage lasted for two weeks. Then came, yours sincerely, disillusionment rude and brutal." Hilton began drinking on their wedding night and seldom stopped. After the honeymoon Taylor went home to her mother and filed for divorce. Of her marriage to British actor Michael Wilding, Taylor wrote: "We had a lovely, easy life, very simple, very quiet. Two babies were born. We had friends. We didn't do much." That all changed when she met Mike Todd. He was the dynamic producer of Broadway girlie shows, promoting the big-screen Cinerama and an all-star film of "Around the World in 80 Days." He swept Taylor off her feet and out of her marriage to Wilding. "He had a joy, a relish about being alive, a vitality that was so contagious," she wrote. "He was a fabulous con artist could con the gold out of your teeth but was terribly, gregariously generous." Todd's life was snuffed out on a New Mexico mountaintop in the 1958 crash of his private plane. Among those who consoled the widow was singer Eddie Fisher. Their romance caused the biggest Hollywood scandal of the time, to be superseded by a bigger scandal surrounding her fourth marriage. In a scenario that would have echos in the Brangelina hookup, Taylor was branded a "home wrecker" for allegedly breaking up Fisher's marriage to Debbie Reynolds, mother of his two children. Two years after her 1959 marriage to Fisher, Taylor met Richard Burton on the set of "Cleopatra" and dumped the singer. They were soon madly in love, and the world's press trumpeted every development of the affair. After divorces from their spouses, Taylor and Burton were married March 15, 1964. They divorced in 1974, remarried in 1975 and divorced finally the following year. In between, they made a number of movies together. From show business, the two-time Oscar winner moved to politics. In 1976 she married Virginian John W. Warner and helped his successful campaign for the U.S. Senate in 1978. They were divorced in 1982. "Being a senator's wife is not easy," she told a reporter. "It's very lonely. I wouldn't wish it on anyone." Taylor's romances during the 1980s kept the tabloids busy but didn't reach the proportions of her earlier ones. She was engaged to New York businessman Dennis Stein and Mexican lawyer Victor Luna. She was rumored to be engaged to the late publisher Malcolm Forbes, but both claimed their relationship was platonic. Her companion as she battled pneumonia in April 1990 was Larry Fortensky, 37, a construction worker she met while both were undergoing treatment at the Betty Ford Center. She married Fortensky in October 1991 at friend Michael Jackson's ranch, as tabloid photographers peered down from helicopters overhead. "Marriage does give a sense of oneness that just being together can't," she said. "You don't get over men like the flu," she said. "Every divorce is like a little death." "I'm not going to join a nunnery," she said. "I said I'm through with marriage, but I'm not through with men - that wouldn't be realistic."